James Justin Acker is a former Major League Baseball pitcher from 1983 to 1992. He played college baseball at the University of Texas. 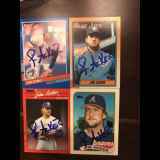 Acker was drafted in the first round by the Atlanta Braves in the 1980 Major League Baseball Draft and was a member of the Toronto Blue Jays teams that won the 1985, 1989, and 1991 American League East division. He also played for the Seattle Mariners. New Response (Success): 1 signed TC.